From the recent Imagine Dragons concert in Vancouver. I thought this was the moment I’d been waiting for, but the best was yet to come. I never paid much attention to the Imagine Dragons before the Grammy Awards on January 26. I was well familiar with their radio-friendly first single, Radioactive, but also knew they were very popular with the kids in the youth programs I work in. Which right there put me off of them, for surely my musical tastes were more discerning than those of a 12-year-old. Then the Grammys happened. I don’t own a TV, but followed the progress on Twitter and the official Grammys website. When Radioactive won Best Rock Performance, it made me curious in spite of myself about what the rest of their debut album, Night Visions, sounded like. In a few more words, it’s easy to see why they’re so popular, and likewise why their fan base is of such diverse ages. Their music is a very catchy, uncomplicated pop-rock hybrid, with straightforward chord progressions, anthemic hooks, and digestible, repetitive lyrics. The kind of stuff you can belt out in the car while speeding down the highway. The kind of stuff so very well suited to the stadium venue of their February 10 concert in Vancouver. I bought my tickets on Craigslist. But that’s a whole other story. Hearing a song I previously disliked played in such a way as gives me a new appreciation for it. That moment – some unpredictable, elusive, awe-inspiring event during the performance – occurs. I usually find #1 very easily, for even my most favourite artists have songs I don’t like, and at its core, live music is all about variations on know songs. Sometimes I find #1 and #2 in the same instance, and a once-disliked song further is elevated to a revelation. And sometimes I don’t. Sometimes it takes patience for That moment to come, as most artists don’t want to peak in the show too early. But I’ve never been to a concert where I didn’t eventually find it. And sometimes That moment finds me. Not all artist sound good live, but the Imagine Dragons’ lead singer, Dan Reynolds, suffered nothing from performing in an huge arena. The light show and motion picture projections of the moon rising, grassy fields, mountains, the Serengeti, post-Apocalyptic industry, and Rorschach-esque evil creatures were a nice compliment to the subject matter of the various songs. 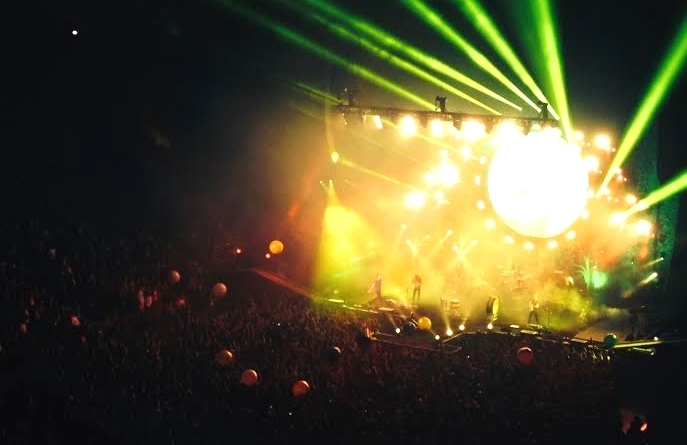 So too were the giant, confetti-filled balloons that were released into the lower bowl audience during the unabashedly whimsical track, On Top of the World. The band played not one but two songs I’ve since come to like a lot: the EP track Monsters and the single Who We Are from the Hunger Games: Catching Fire soundtrack. As for That moment, when it finally came, I was doubly blown away because I thought it had already occurred. I thought it was the giant balloons and their accompanying ring of lights like a carnival. A charming moment, yes, though in truth, not quite moving enough to get me out of my seat or to distract me from the awful dance moves of the drunk kids in the row ahead of me. Instead, That moment occurred during the encore, with in introduction to the song Nothing Left to Say. This song that boasts some of the most simplistic lyrics of the entire album. Nonetheless, it’s one of my favourite Imagine Dragons songs, now more than ever after hearing Reynolds intro the song with its chorus sung at one-third its normal speed and backed by only a sustained bass note and a guitar strumming the first chord of every bar. There’s nothing left to say now /There’s nothing left to say now/I’m giving up, giving up, hey, hey, giving up now/ I’m giving up, giving up, hey, hey, giving up now. …while the lights of the audience’s phones shone in the stands like stars. It was magical. It pulled me out of my seat as if on a string to sing along with the rest of the song. A quick search on YouTube doesn’t show him having done this in any other concert where people recorded, which suggests this was indeed something special. All in all, the Imagine Dragons put on a great concert. Not an amazing one – overall, they didn’t bring enough to their live sound that was different, in my opinion – but a solid kick-off to my concert-going year. Which, since many of my favourite artists are releasing albums in 2014, should include plenty more shows. Music lovers: What’s a memorable concert you’ve attended? What was That moment? What concerts are you looking forward to this year? Let me know in the comments. This entry was posted in Music and tagged Art interpretation, Concerts, Imagine Dragons, Pop, Rock. Bookmark the permalink. I grew up on Pink Floyd, so when their Division Bell album came out I could not wait for the concert. I took my oldest son and his girlfriend. After they played their first song, the young crowd was so awed they did not know how to respond. (They were also all stoned.) I stood on my chair and blew a shrill whistle. David Gilmore said, “Well, we have got one fan!” Then the whole crowd rose to their feet, cheered and whistled. Nobody sat for the rest of the night. It was the most fantastic concert I have ever been too in all my 53 years, and I have seen the Stones live. The music, video, laser show, and huge pigs were too cool. That sounds awesome, SK – way to be the one to get the party started! I think in addition to every concert having That moment, every music-lover has That concert – the one they never forget. I haven’t found mine yet – it’s not been long that I’ve lived in a city large enough for big concerts, or had money to go to them – but I hope, when I do, it’s as memorable as yours was. I hope you have a great time, Melissa. Where are you seeing them? I had to look up ‘Imagine Dragons’ *blush* but that was a great review Janna. I’ve been to a few gigs in my time and have rarely felt let down. So many highlights but Joe Walsh’s guitar on ‘Hotel California’ will live with me for a very long time. Don’t be embarrassed, Roy – they’re still a relatively new band, and may not be popular where you are. Hotel California is an amazing song; that must have been incredible to hear it live.